M-type hexagonal ferrite samples with composition BaFe12O19 have been prepared by two different chemical routes, namely co-precipitation and microemulsion, in presence of different amounts of cationic surfactant cytyltrimethal ammonium bromide (CTAB). 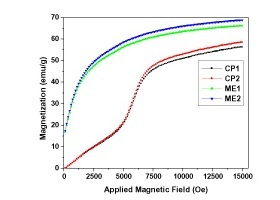 The microstructural and magnetic properties of the BaFe12O19 hexaferrite particles have been investigated under the influence of cationic surfactant, CTAB using XRD, FTIR, SEM, TEM and Vibrating Sample Magnetometer (VSM) techniques. The X-ray diffraction patterns at room temperature show that the prepared samples have a single phase. FTIR results confirm the formation of pure barium hexaferrite. SEM analysis shows the effect of CTAB on reduction of particle size during synthesis using two different routes. TEM results reveal synthesis of barium hexaferrite nanoparticles after calcinations at 800º C temperature. VSM results reveal that the values of saturation magnetization (Ms), intrinsic coercivity (Hc) and remnant magnetization (Mr) depend upon the method of preparation. BaFe12O19 hexaferrite particles of single domain were produced by using a microemulsion technique.